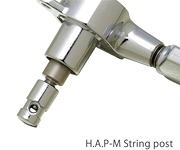 What’s – H.A.P-M | G-GOTOH Ltd.
What’s? – About Gotoh HAPM. Gotoh HAPM is specially created for controlling a post-height of steel string guitars, in addition to locking a string easily and quickly. And prepared for all of SG/SD guitar peg series. HAPM can be customized as orders are received, same as buttons and colors. Combining the ability of Post Height Adjustable and Magnum Lock. Keeping the current function, locking stability has been improved with the introduction of new smaller string holes on 1st, 2nd and 3rd string posts. Locking feature gives a machine head that is the perfect choice for flat peg-head guitars equipped with Vibrato. Removing the string tree on this type of guitar is essential for tuning stability to keep in tune when in playing as it makes ultimate string tension by staggered string posts function.